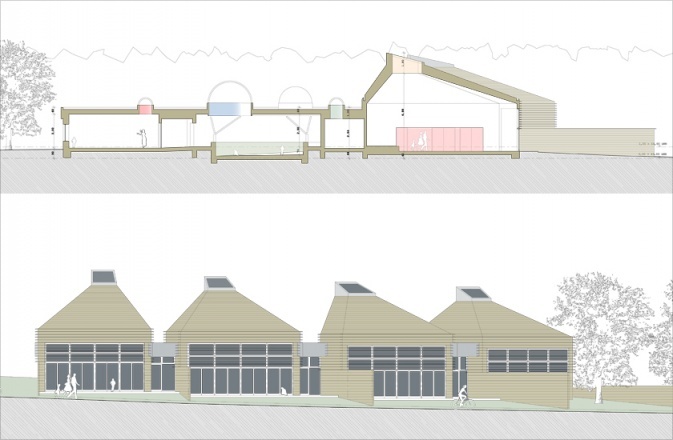 CAMA A was awarded third prize for its design for the extension to the Independent Waldorf School in Kleinmachnow. 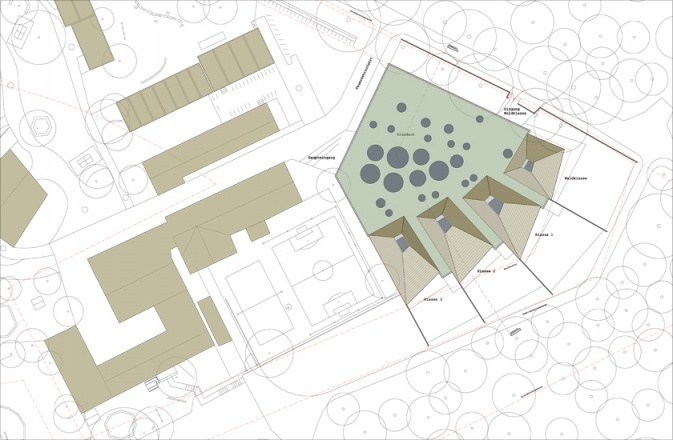 The design extends the village-like character of the existing campus, which blends into the sorrounding woodland. The new building is made up of 2 elements. 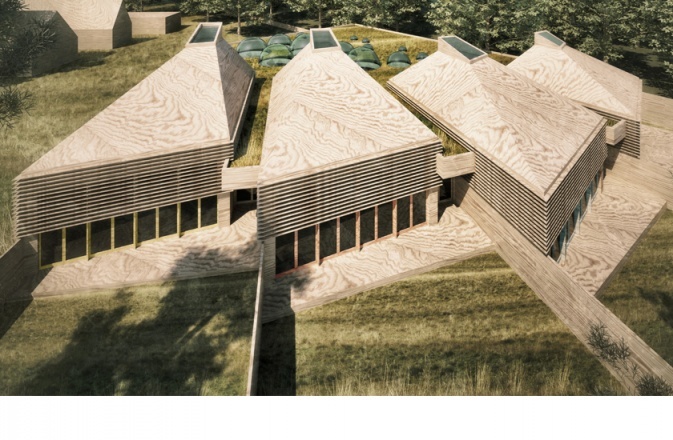 The first consists of 4 forest cabins each given individual character by own easily visible timber roof and conceived as a new cottage in the village on the edge of the wood. The second is the flat roofed element that contains all other service functions and links the 4 cabins. All rooms are arranged on one level, in order to ensure the best possible relationship between internal spaces and landscape and optimise access for the disabled. Every class room has its own garden and is located on the south side of the site in order to optimise natural lighting. 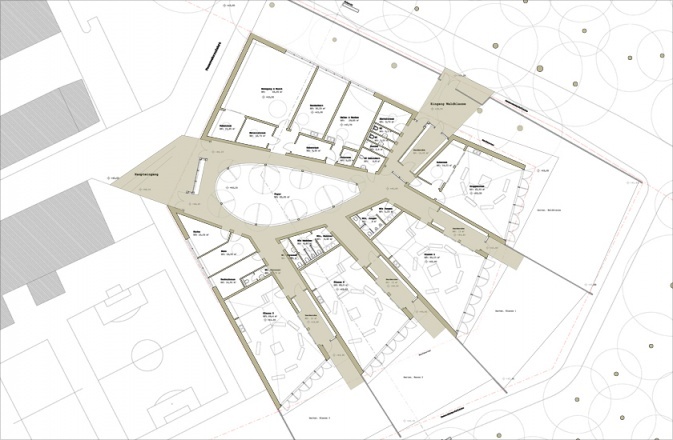 The main entrance is located on the north side and is orientated towards the existing centre of the school campus. The reception class (Forest Class) including service rooms forms its own cottage in the village, although it is integrated into the building. This cottage is furthest from the village green and is sorrounded on 2 sides by gardens and woodland. The Forest Class is accessable from the Foyer, although it has its own private entrance area accessible from the street. The main entrance, Foyer and circulation spaces are conceived as an extension of the exterior landschape. The floor of this interior landscape is inclined in order to reflect the external landscape and in order to avoid steps between the interior rooms and gardens. Tree-like columns divide the Foyer from the sorrounding circulation and relate to the encircling wood. The flat roof forms a second green landscape level and is sprinkled playfully with roof lights that flood the Foyer with natural light. The class rooms are designed individually and are open on one side to the gardens. One wall reaches into the landscape in order to schield the gardens from each other and in order to link room and garden. The roof lights provide additional lighting and ventilation in the rear part of the room. The changing rooms are located between the class rooms and are linked simultainiously to the Foyer, the class rooms and the gardens. The traditional sloping roofs of the rooms are archaic froms that are intended to be recognisable to the young children who a taught here, as their cottage in the village.